YTI’s Work-Life Balance & Disability Study is, to our knowledge, the first study to survey competitively employed people with a variety of disabilities nationally, examining not only workplace experiences but the broader issue of work-life balance. This website features stories of how people with disabilities manage work and other life domains, and includes findings from our research. Please take our quick, anonymous poll to help continue research on work-life balance & disability issues. Poll: Have you experienced physical assult in the workplace? This diagram shows how having a disability can affect a person both at work and in their personal life. Although workers with disabilities have the same types of work and life concerns as their colleagues without disabilities, they face some additional challenges. For instance, while workers with and without disabilities may have family responsibilities, employees with disabilities may encounter negative attitudes about their right or fitness for parenting given their disability. At work, people with disabilities are more likely to experience harassment and discrimination. And, although leisure activities can help any worker to manage stress from their work and personal life, inaccessibility of leisure sites or unwelcoming attitudes can make for more stressful leisure experiences. Although workers with disabilities have the same types of work and life concerns as their colleagues without disabilities, this model shows some of the additional work-life challenges faced by employees with disabilities. Learning from the collective action of other oppressed groups, people with disabilities began to come together, across disability types, to advocate for equal opportunity in all aspects of community life. Today, more people with disabilities are participating in “typical” societal roles and community activities than was the case a few decades ago. Legislation has helped to substantially increase the community participation of people with disabilities. In particular, the Americans with Disabilities Act of 1990 and the Rehabilitation Act of 1973, have improved physical and programmatic access, enabling more people to take part in various community settings including schools, workplaces, and recreational sites. The Rehabilitation Act of 1973 is one of the most significant pieces of disability legislation in that it granted people with disabilities rights to federally funded facilities, programs and services, and promoted the field of vocational rehabilitation to assist people with disabilities to find employment. Getting the Rehab Act signed into law was a pivotal point in the disability rights movement, as it was the first major advocacy effort undertaken on behalf of people with disabilities which was led by people with disabilities, themselves. It was also significant in that the effort involved collaboration among people with different types of disabilities, who acknowledged shared experiences of oppression and isolation and sought the benefits and privileges of full community citizenship. The Americans with Disabilities Act of 1990 is the most comprehensive disability civil rights law ever enacted. It extends the expectations of equal access and equal opportunity that apply to federal programs under the Rehabilitation Act to public and private buildings, programs, and services. In so doing, the law recognizes the role that society plays in the construction of disability through policies, practices, and physical spaces that have historically excluded people with disabilities, and holds these entities accountable for addressing these barriers and including people with disabilities. As the intent of these laws have begun to be fulfilled, and people with disabilities have become more engaged in community life, they have done so with some concerns or challenges that make their experiences different from those of their peers without disabilities. Stigma, or the tendency to view the presence of disability as a negative trait suggesting that a person is less able or less attractive, impacts how people are viewed not only in an educational or employment context, but also in social situations. And, the actual impairments that may result from a given disability, such as fatigue, difficulty with communication, or misinterpretation of social cues, further influence how people are responded to by others, and the degree to which they are included or excluded from work and other life domains. Stigma, along with a tendency to mistakenly view disability as always indicative of poor health, as resulted in disparities in multiple arenas including healthcare, leisure, employment, education, and social roles and relationships. Today, it is not uncommon for people with disabilities to work, marry, raise families, provide care to spouses, parents, and/or children, participate in leisure activities, and contribute to their communities through volunteering and other forms of civic engagement. In short, their lives are much like those of people without disabilities. As such, they experience the same types of stressors and concerns as their nondisabled peers, along with the unique concerns of stigma, functional limitations, and disparities in multiple life domains. A significant challenge that people with disabilities contend with is the tendency for employers, neighbors, family members, and others to view disability as their single or most salient identity, when in fact, as with all people, people with disabilities have multiple intersecting identities (race, gender identity, sexual orientation, age, etc.). These identities are fluid and one may be more salient than others within a given context. When people with disabilities are viewed as having solely a disability identity, it devalues other, equally important and valuable perspectives they may have, and leads to misunderstanding about their wants and needs. Nearly 30% of participants in YTI's Work-Life Balance & Disability Study had children under the age of 18 living at home. Despite legislation and increased community participation, the employment rates and economic status continue to be lower among people with disabilities than among their nondisabled peers. Also, people with disabilities tend to enter the workforce later and leave it sooner than people without disabilities. And, their experiences within the workplace are often quite different. One of the greatest challenges to the workplace inclusion of people with disabilities is that the term disability implies inability. And, due to the “spread effect” people may assume that a person's disability negatively affects them in ways that goes well beyond their actual functional differences. Such misperceptions about the competence of people with disabilities are particularly problematic in an employment setting where success is typically measured by productivity and competence. People with disabilities who are employed, may feel as though they must work “twice as hard” to prove their worth to an employer and justify why they are working rather than relying on disability benefits. When people without disabilities think about employment, it is usually around whether or not the person is working full time or part time, or perhaps, whether or not they enjoy their job. However, conversations about employment among people with disabilities are more complicated. Work models vary from piece-rate jobs in sheltered workshops to working independently alongside peers without disabilities, meeting the same performance expectations, in what is referred to as competitive or “regular” employment. The varied work models suggest that society does not view “regular” employment as a realistic or necessary goal for many people with disabilities. This is changing. For example, in recent years there have been efforts to close sheltered workshops and create more integrated community work opportunities. This shift was prompted by cases in which people with disabilities were maintained in institutional living situations where they were required to perform tasks to maintain the facility and profit the owner, rather than given the opportunity to live and work in the community. These long-held beliefs of lesser ability and lowered expectations impact the workplace inclusion of people with disabilities. Family members may also hold such beliefs and discourage employment. Sometimes they are concerned for the person’s health and safety. Sometimes family members are relying on a person’s disability benefits and/or their assistance with household chores, childcare, and other tasks to assist the family. Sometimes, negative beliefs about disability may be held by people with disabilities, themselves. In addition to attitudinal barriers to workplace inclusion, social policies have further discouraged the workforce participation of people with disabilities. For example, concerns about loss of financial or medical benefits deter many from pursuing employment. Further, some insurance programs will not cover the cost of durable medical equipment, such as wheelchairs, unless they are needed in the home, requiring people with disabilities who need these items solely for employment and other community based activities to either misrepresent their needs or go without. The presence of disability can impact how a job is performed. In some instances “reasonable accommodations” are needed. These modifications to the way work gets done enable qualified workers to perform essential job functions. Accommodations can include equipment, changes in work schedule, adjustments in how supervision is provided, and the opportunity for breaks during the work day, or other adjustments. These strategies help address the functional challenges of a person’s disability. According to the Workplace Bullying Institute (WBI), approximately 7% of U.S. workers experienced bullying in 2014, and racial and ethnic minority group members reported higher rates of being bullied than their white peers. The WBI Survey did not ask whether or not respondents had disabilities. However, these findings suggest that, similar to other marginalized groups, workers with disabilities may be bullied more often than their colleagues without disabilities. Being pushed toward taking an early retirement or constructive discharge by the perpetrators’ making the work environment so intolerable that a reasonable person would not be able to stay. Study participants were subjected to mistreatment not always or solely because of disability, but also due to gender, age, sexual orientation, and other personal characteristics. These findings suggest that, similar to other marginalized groups, workers with disabilities may be bullied more often than their colleagues without disabilities. Work-Life balance refers to how one manages roles and responsibilities across life domains. Most research has focused on working mothers’ negotiation of work and family obligations. Self-care, leisure and other needs are rarely explicitly considered. Everyone’s definition of balance is different, and research suggests that perceptions of balance may be influenced by personal characteristics such as gender and race. “Balance” between work and the other aspects of life has been conceptualized in a number of different ways. A common perception of work-life balance is the idea that people mist devote the same amount of time and attention to their work and family/personal lives. This is rarely possible. Today, it is generally acknowledged that “you can’t have it all”, at least not equally and at the same time! Another way of perceiving balance is as experiencing minimal tension between the roles, responsibilities and relationships in one’s work and personal life. In this framing the goal is to have adequate resources within the work and personal domains to meet needs and obligations in both. Today, many view balance as a sense of satisfaction and achievement across all life domains. This includes not only work and family but also self-care, and leisure/social domains. This perception of balance is less about the quantity of time and more about the quality of experience across domains. Research suggests that there a many individual and organizational characteristics that contribute to positive work-life balance. On an individual level, characteristics such as self-perception, the presence of supportive personal relationships, healthy leisure outlets, and good self-care practices have all been found to benefit how individuals feel about and manage demands in their work and personal lives. Organizational characteristics that support positive work-life balance include safe and inclusive workplaces, trust in organizational leadership, supervisory support, and the availability of family-friendly workplace policies. Work-life balance research has rarely examined how the presence of disability might influence perceptions and achievement of a sense of balance. Studies suggest that due to unique stressors, workers from marginalized groups may have a more difficult time and lower expectations when it comes to achieving and maintaining a sense of balance, than do other workers. As with other marginalized groups, people with disabilities have been stigmatized, isolated, and prevented from participating fully in their communities. With changing views about disability and legislation that fosters the inclusion of people with disabilities in work and community life, they have entered into these experiences with unique concerns. The issue of disability disclosure is particularly problematic. While some disabilities are readily apparent, the ways that they impact a person may not be obvious. And, many types of disabilities including chronic physical and mental health conditions may not be obvious. The decision to disclose a disability is a personal and often difficult one. When employers and coworkers know about a person’s disability, they may treat the person in ways that diminish their contributions to the organization and fail to provide opportunities for professional development and career advancement. Sometimes, such as when workplace accommodations are needed, the person may be subject to hostility, if others view the accommodations as “special treatment”. For these reasons, even when a person discloses a disability, they may downplay the degree to which it impacts work and other life domains. While anyone who works outside the home has to get to the workplace, getting there can be more challenging for people whose physical, cognitive, sensory, or emotional disabilities prevent them from driving. Reliance on public transportation can, in some cases, add hours to the person’s work day. Figuring out and coordinating transportation can equate to another job. When a person’s disability requires that they do things in a different way, they may take more time than most people to do ordinary tasks throughout the day. This can be a stressor because while unavoidable, the extra time adds up and may make it more challenging for some people to complete work and personal tasks as efficiently as they would like. A sense of belonging is associated with more positive worker wellbeing. However, for people with disabilities, being accepted and included in a workplace community may be hindered by feelings that they must continually excel at work to be seen as a committed and able employee. Transportation challenges or self-care needs may make after work socializing difficult. And, coworker interactions may be uncomfortable for both people with and without disabilities. In order to achieve and maintain positive work-life balance, people use a number of different strategies. These include support through personal relationships, use of family and disability-friendly policies, and engaging in healthy forms of leisure and good self-care practices. Family and friends can be key resources in managing work and life with a disability. They may assist with personal care, help with household tasks, provide transportation, provide childcare, and/or assist with leisure pursuits. Increasingly, employers are offering a range of family and disability-friendly policies that aid in positive work-life balance. Resources such as employee assistance programs (EAPs) and paid vacation and sick leave, benefit all employees. Opportunities for telework, where people work from home are also increasing. Flex-time and flex-place work options allow workers to adjust their schedule and/or work location as long as they are able to complete required job tasks. This flexibility can be especially helpful to workers with disabilities’ work-life balance. Taking the time to relax, play and care for one’s health and personal needs is important for all workers. For people with disabilities, finding time for renewal and self-care is essential. It aids in disability management and may reduce the chance of developing secondary health conditions. Unlike their nondisabled peers, for people with disabilities, the time and effort it takes to do leisure and wellness activities is often compounded by the need to coordinate transportation, and/or assistance to do the activity. Further, many recreation and wellness sites are not fully accessible or welcoming to people with disabilities. Consequently, people with disabilities may have fewer outlets for managing the stress that can result from work and life concerns. 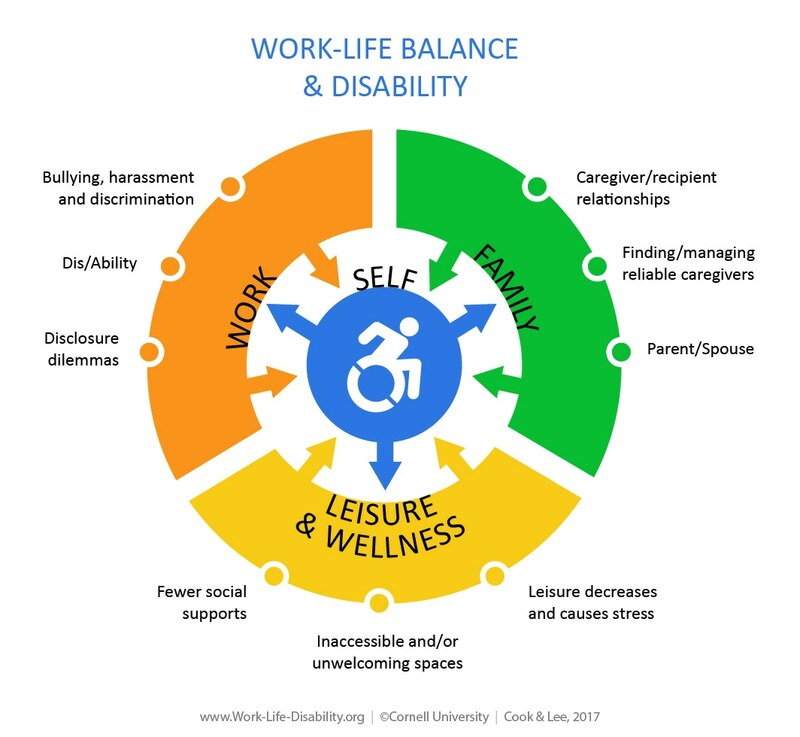 This website were developed by Cornell University under Work-Life Balance and Disability: Getting and Keeping People with Disabilities in the Workforce (Grant #90IF0051-01-00) from the National Institute on Disability, Independent Living, and Rehabilitation Research). NIDILRR is a Center within the Administration for Community Living (ACL), Department of Health and Human Services (HHS). The contents do not necessarily represent the policy of NIDILRR, ACL, HHS, and you should not assume endorsement by the Federal Government. © Cornell University | 201 Dolgen Hall Ithaca, NY 14850. For more information about issues raised by participants in YTI’s Work-Life Balance & Disability Study, refer to the project-related publications and other sources listed below. Cook, L. H., (in press). Workplace bullying and harassment of individuals with disabilities. In T. Heller, S. Parker Harris, C. Gill, & R. Gould (Eds. ), Disability in American Life: An Encyclopedia of Concepts, Policies, and Controversies Santa Barbara: ABC-CLIO. This article explains what workplace bullying is, and how anti-harassment law applies to disability-related bullying. von Schrader S., & Cook, L. (in press). Disclosure & Self-Identification in the Workplace. In T. Heller, S. Parker Harris, C. Gill, & R. Gould (Eds. ), Disability in American Life: An Encyclopedia of Concepts, Policies, and Controversies Santa Barbara: ABC-CLIO. This article explains the difference between disability disclosure and disability self-identification in the workplace, as well as the benefits and potential drawbacks that can make disclosure decisions uneasy for workers with disabilities. This blog post highlights how being in the role of caregiver and/or care recipient may influence the work-life balance of people with disabilities. This article describes some of the factors to consider when deciding whether or not to disclose a disability in the workplace. It includes findings related to disability disclosure from YTI’s Work-Life Balance & Disability Study. This paper presents findings from a study that explored participation in employer-sponsored wellness programs by workers with disabilities. Individual, social, and organizational factors, including the provision of user-friendly marketing materials and social support from workplace colleagues, influenced participation. This article describes possible work-life challenges for people with disabilities and offers suggestions for effective work-life management. This paper presents findings from a qualitative investigation of the role of leisure in the work-life balance of employed people with mobility impairments. It highlights the benefits of a positive disability identity, the importance of accessible leisure, and the value of similarly able friends on work-life management. This paper presents findings from a survey of individuals with disabilities focused on identifying and better understanding the factors that influence disability disclosure decisions. Results highlight the barriers and facilitators that influence individuals’ decision to disclose and the important role that employers, managers, and workplace climate play in the decision. This paper proposes that a worker’s decision to adopt a disability identity in the depends on various factors that function at the intraindividual, interpersonal, organizational, and societal levels, impacting disability disclosure and requests for accommodations, as well as workers’ safety and well-being.